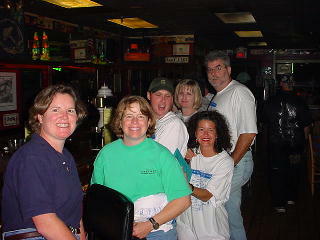 Here's many of our group from 2003 at Athens' Globe. 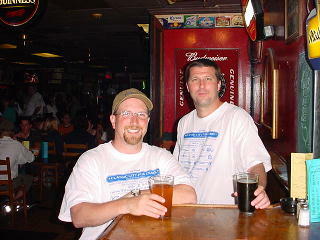 (Notice our stylish, matching Classic City Pub Crawl shirts.) 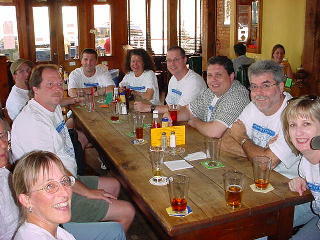 Clockwise from left: Joanne, Mark (looking ponderous), Todd, Dave, Martha, Jeff, Thel, Dean and Gail. The Globe now has delicious FOOD as well as beer. 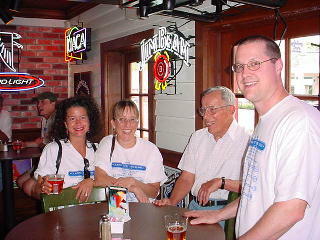 Globe, 199 North Lumpkin St.
Taco Mac, 558 West Broad St.
Copper Creek Brewing Co., 140 E. Clayton St.
Mellow Mushroom, 259 East Broad St.
Molly O'Shea's Irish Pub, 430 East Clayton St.
Classic City Saloon, 335 E. Clayton St.
Athens Steam Co. Pub, 295 E. Dougherty St.
Wild Wing Cafe, 312 E. Washington St. The Terrapin Pale Ale was extremely tasty at Taco Mac. right across the street from the Holiday Inn Express. Athens' only brewpub and features fine ales and a diverse menu. 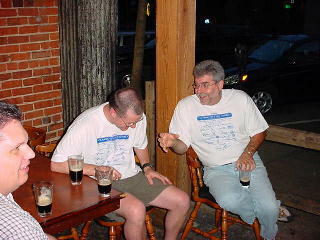 Craig and Dave enjoy a pint at the Mellow Mushroom. at Mellow Mushroom are fantastic! Don't even ask what Dean said here to crack up Jeff! 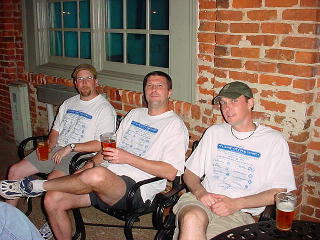 The Guinness was refreshing on the front patio at Classic City Saloon. at the bar of the Mellow Mushroom. "Which beer are we going to order next?" 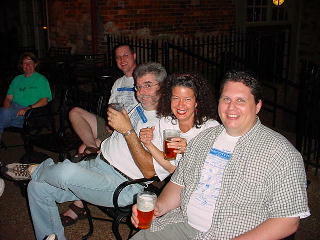 Terrapin Pale Ale on the patio of Athens Steam Company Pub. We thought better of crashing the wedding reception next door. 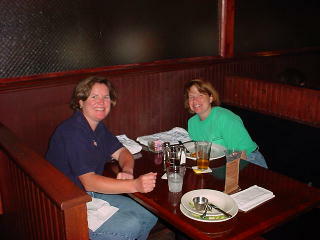 evening at Molly O'Shea's Irish Pub. What a fun night!